DRAPER, Utah, Oct. 25, 2012 – Flexpoint Sensor Systems, Inc. (OTCBB:FLXT) today announced that its innovative partner in wireless sensing technology, Monnit, has released two new products featuring Bend Sensor® technology. One is a seat sensor for occupancy detection and monitoring, Wireless Seat Occupancy Sensor and the other is designed to measure airflow in HVAC systems, Wireless Airflow Sensor. These products are now available for purchase on Monnit’s web site at http://www.monnit.com. Both products transmit data wirelessly to Monnit’s online sensor monitoring and alerting system, which can be easily accessed from any PC or smartphone. The products, which have been under development for the past few months, are designed to meet growing demand for accurate, durable, easy to install occupancy and airflow solutions. Both of these products target large industries and have multiple applications. There are tens of thousands of entertainment venues and hundreds of thousands of buses in the US alone, which represent just two of the potential markets for the occupancy sensor. HVAC is an $88 billion industry. Together, Flexpoint’s proprietary thin film sensors and Monnit’s wireless infrastructure and online system are an ideal combination for easy to use “plug and play” solutions that can be used by clients in transportation, stadiums and theaters, HVAC and other industries. Flexpoint Sensor Systems (OTCBB:FLXT) is an innovative technology firm specializing in developing products that feature the Company’s patented Bend Sensor® and related technology. The Bend Sensor® is a groundbreaking sensing solution that is revolutionizing applications in the automotive, safety, medical and industrial industries. The Bend Sensor’s single-layer, thin film construction cuts costs and mechanical bulk while introducing a range of functions and stylistic design possibilities that have never before been available in sensing technology. Flexpoint’s technology and expertise have been recognized by the world’s elite business and academic innovators for over 17 years. The company is setting a new standard for sensing solutions in the “smart” age of technology. The “Internet of Things” takes the number 4 spot on Gartner’s Top 10 Strategic Technology Trends For 2013. From the article: Internet of Things: Internet of things is already here. Over 50% of Internet connections are things. In 2011, over 15 billion things on the Web, with 50 billion+ intermittent connections. By 2020, over 30 billion connected things, with over 200 billion with intermittent connections. Key technologies here include embedded sensors, image recognition and NFC. By 2015, in more than 70% of enterprises, a single exec will oversee all Internet connected things. Becomes the Internet of Everything. When dealing with wireless sensor networks, there are a lot of factors that affect the quality and reliability of transmission signals between your sensors and the gateway. We have compiled a list of useful tips to improve your wireless sensor network. Whenever possible, position your wireless gateway in a central location within your facility. If the gateway is against an outside wall, the signal will be weak on the opposite side of your building. Position your Wireless Gateway Correctly. If you have cordless phones or other wireless electronics in your facility, your gateway might not be able to “hear” your sensors over the noise from the other wireless devices. To quiet the noise, avoid wireless electronics that use the 900MHz frequency. Instead, look for cordless phones that use the 5.8GHz or 2.4GHz frequencies. Maintaining proper cold chain distribution processes extends and ensures the shelf life of your produce, frozen food or pharmaceuticals by keeping them at the proper temperatures all the way to the customers hands. Monnit’s wireless temperature monitoring solution provides an efficient, low-cost way of tracking cooler temperatures for proper operation and temperatures, potentially saving you thousands of dollars in spoilage. Monnit’s affordable wireless temperature sensors measure and track the environmental conditions of your storage coolers and send instant notifications via email or SMS text if a set condition is exceeded. Save time and money while conforming with Health and Safety Standards. 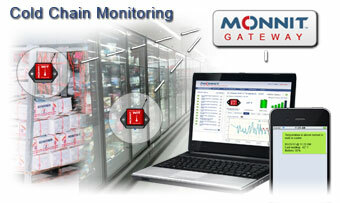 Ensure that your cold chain is being maintained by using Monnit wireless sensors.